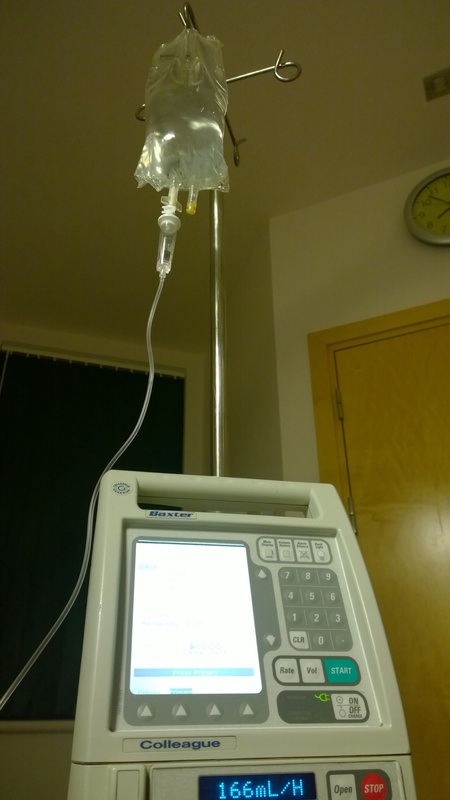 December 22, 2014 February 5, 2016 robinbtaylor Health, Procedures	catheter, Intravenous, medical procedures. I thought I’d talk about some of the procedures that I’ve so far been through and explain a little about what they’re used for, why and more importantly what it feels like. 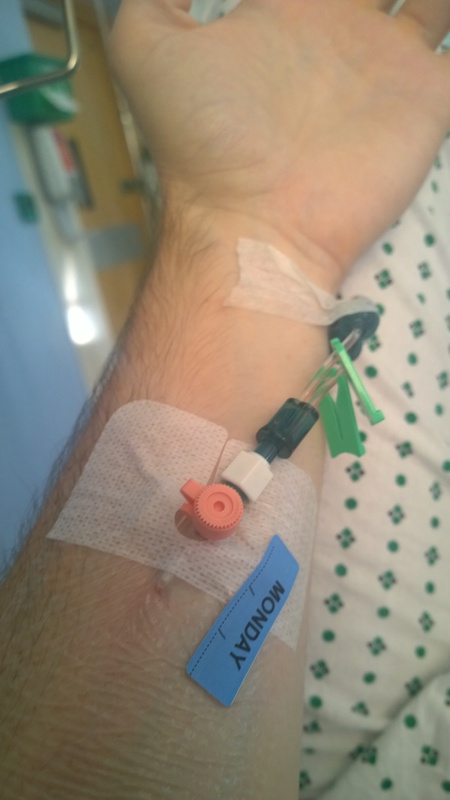 Today, I’d like to talk about the Catheter, anyone who’s been in hospital for a few days will have experienced these, but for me it’s a fairly new experience. A catheter is a small tube with a valve that is inserted into a vein usually below the elbow. they can be placed at any point, usually where the larger veins are, in my experience (I’ve had about 8 inserted over the last couple of weeks) I prefer them to be in the forearm as it’s easier to write and shower than when it’s in the wrist or elbow. They’re inserted using a needle which is relatively pain free (a small scratch) which is then removed leaving a tube in place. It is secured using a waterproof adhesive label, although this sometimes need replacing after a shower. 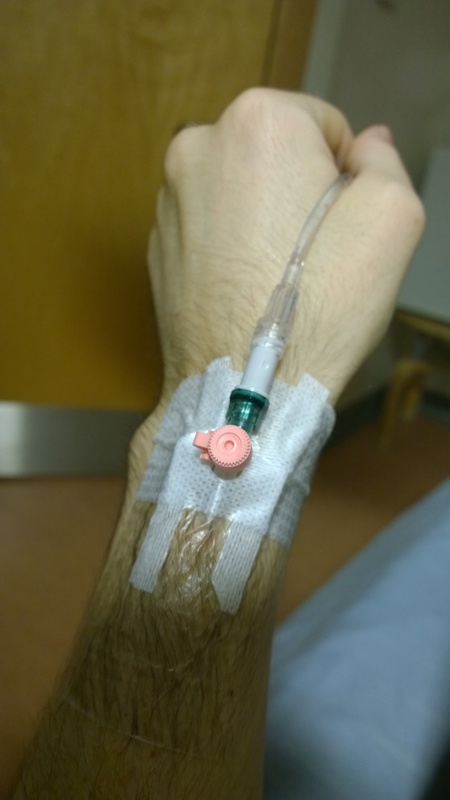 A catheter is used to apply fluids (I’m currently hooked up to a saline drip to make sure my bladder is fully flushed through ready for treatment) it can also be used to apply medicines such as ‘intravenous paracetamol’ which is more potent and fast acting than tablet form. It can also be used for taking blood samples rather than having to puncture the skin several times. What are the side effects/downsides? Sometimes if they’re inserted or removed a little quickly they can bruise is the skin as a little blood is let out under the skin. Otherwise, I’ve experienced no worrying or painful experiences, the medical nurses apply these regularly and can help with any concerns. 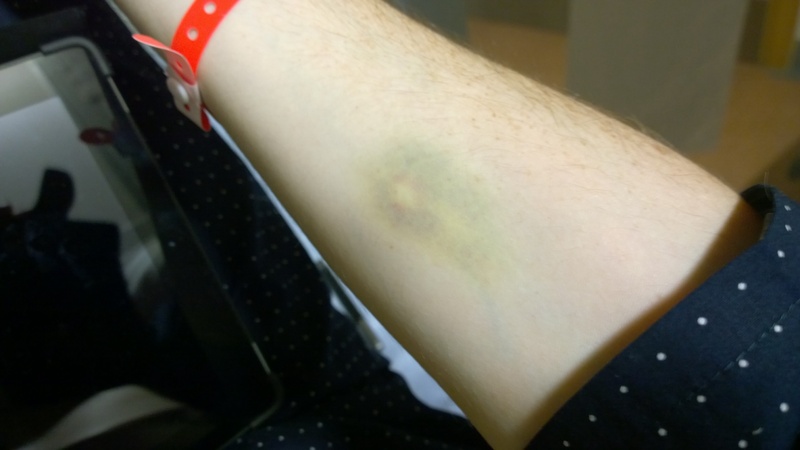 Bruise from removal from a small vein.